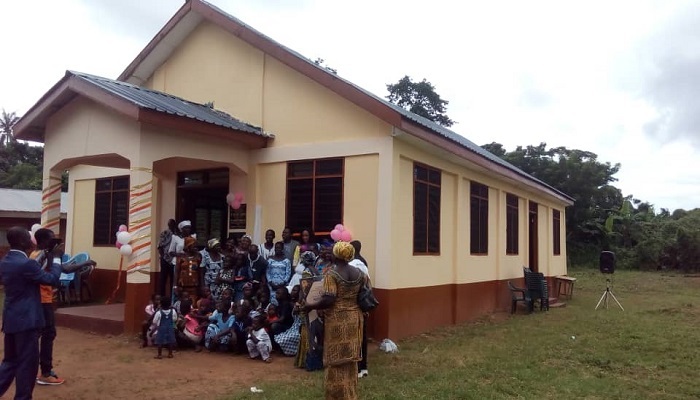 Pastor Vincent Avornyo of Qodesh, Light House Chapel, Accra, has donated GH¢50,000.00 to support the construction of the Adenkensu Assembly church building in Nkonya Wurupong District of the Hohoe Area of The Church of Pentecost. The total cost of the project which was dedicated recently was GH¢60,000.00. Speaking on the topic, “You Still Lack One Thing,” Pastor Julius Jim Dogbey of Kwamikrom District of The Church of Pentecost, said Jesus Christ abhours people who have made money their god. He said such people cannot worship God well, because they are always hooked to what they value more than the Word of God. He therefore charged believers to examine their lives to ensure that they have given their all to the service of God. In a remark, the Hohoe Area Head and Executive Council Member of the Church, Apostle Yaw Adjei-Kwarteng, advised the congregation to be mindful of the things which the Lord expects of them. The Area Head was full of admiration for Pastor Vincent Avornyo and his wife Anastacia for the kind gesture. The Nkonya Wurupong District Minister, Overseer Edward Fosu, thanked his predecessor Pastor Joseph Tawiah Kwao for starting the project. Later in an interview, Pastor Vincent Avornyo said that the Holy Spirit laid it upon his heart to help the assembly get a permanent place of worship. He thanked the Almighty God for helping him to successfully accomplish a task he embarked on. He was glad to have had the opportunity to contribute to the Kingdom business. Present at the ceremony were the Area pastorate, the chiefs and elders of Adenkensu, among others.